I’m sure you have heard people say don’t sweat the small stuff? Both the book and more likely, the phrase. In fact the full title of the book is Don’t Sweat the Small Stuff…and it’s all small stuff. Because, like you, I lose sight of the big picture when I am constantly mired in the small, largely insignificant details. Written in 1996 by Dr. Richard Carlson, Don’t Sweat the Small Stuff, was a popular self-help book for leading a calmer life. Dr. Carlson broke down complex topics in to short chapters. 100 chapters to be precise. 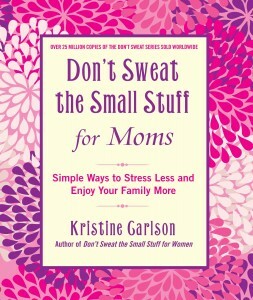 Kristine Carlson has written the first Don’t Sweat the Small Stuff book in nine years. Carlson, the wife of the late Richard Carlson, shows how moms can live with less stress and ultimately achieve more happiness. Waiting for a Teaching Moment — We all struggle with when to start a conversation with our children. Carlson advises that moms might have to wait for the right moment to talk about a weighty topic. Get to know your children. Wait for when your children are ready to not only listen to the information, but actually hear it. Learning to Say “No!” So You Have Time To Say “Yes!” — A few years ago I was Super Volunteer. Chair of this. Volunteer of that. I loved helping out, but I came to a point where I missed a couple of classroom volunteer assignments because of a sick child or a work commitment. I realized I was spread too thin. Carlson advises prioritizing what you need to do. Access what you can do. And politely decline other invitations. Chances are that the person asking you will find someone else who has more time available. Being a “Cool” Mom Isn’t What Your Child Needs — I am far from being the cool mom. I’m not bothered in the slightest. I don’t want to be the cool mom. When I have kids at my house or chaperone an event, I am “ON.” I’m always vigilant. It scares the life out of me to think about a mom or dad purchasing alcohol or condoning the drinking of alcohol at a teen party, just so that they can be the “cool parent.” I’d much rather be the “wet blanket” parent! I like that I can pick up Don’t Sweat the Small Stuff for Moms…read a chapter or two…and then later dip in to the book again to read another couple of chapters. I know that I will refer to this book in good times and in times of struggle. After reading a couple of chapters, I realized that we are not at that stage yet. I know I will pick up this book when we are at that stage. Like I’m a Don’t Sweat Mom on Facebook. I was given Don’t Sweat the Small Stuff for Moms to facilitate my review. All views expressed in this post are my own. Affiliate links within the post are for my amazon affiliate account. I follow the tenets of Blog With Integrity.